Last year, the Solomon R. Guggenheim Museum captured the public’s attention with a working, solid gold toilet installed in one of its restrooms. This year, they're are going for something a little more subtle: A “desert” that’s acoustically soundproofed to prevent anything but the lowest of ambient sounds. 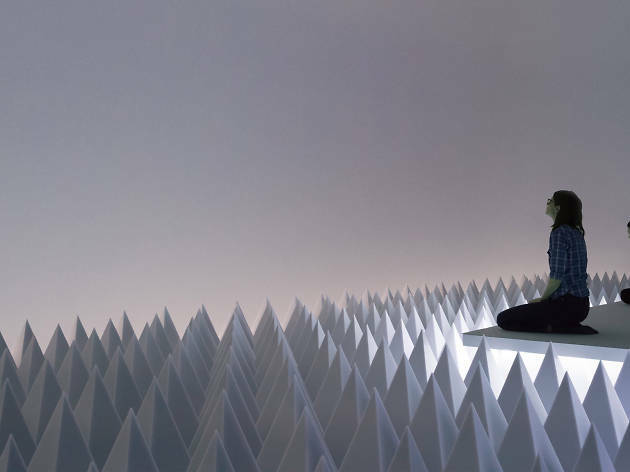 PSAD Synthetic Desert III, as the installation is formally titled, is the creation of West Coast artist Doug Wheeler, who originally conceived the idea nearly 50 years ago. Working in collaboration with the museum, Wheeler is finally realizing the project after all this time. 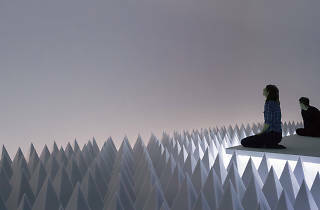 The work consists of a viewing platform jutting into floor covered with rows of steep pyramids made of sound-dampening material (the piece is basically a high-cultural version of those semi-anaechoic chambers used by scientists and manufacturers to conduct acoustical experiments). Special lighting fools the eye into thinking the gallery is an endless space. Wheeler likens experiencing his work to wandering the Arizona desert where he’s spent time. Howard is the editor-at-large and chief art critic for Time Out New York. Follow him on Twitter at @HowardHalle.